As this is the first iteration of the series I feel some clarification is needed in order to understand the concept of the series. In this series i will attempt to make a prediction for the most recently released or set to be released weapon and deem it as a SPLASH or CRASH. If a weapon is deemed to make a SPLASH I believe it will find its way into the current meta or shift the meta all together. On the other hand, if it is deemed to CRASH I see no hope in the weapon or it is missing a certain something holding it back from entering the current meta. Also, for the sake of clarity I want to emphasize that these are my own personal opinions of a weapon in the current patch or version of Splatoon 2. A future patch may invalidate all of my initial prediction or I may just be flat out wrong from the start. I also would like to make it known that I personally would enjoy and encourage new weapons in the meta so we see more variety in tournaments, however if I believe a weapon is going to CRASH I will not sugarcoat it. Still don’t let my words dissuade you from trying out a weapon and forming an opinion of your own as no one person can be certain how good a weapon may be. You might be the person who discovers a weapon is viable, broken, or fits a specific niche. With a new patch just released obviously what I say may not be 100% accurate, but still for the most part the new patch probably won't affect this review. With that said lets begin, starting with my predictions for the foil flingza roller. The foil flingza roller sporting the suction bomb and tentamissiles to round out its kit, made its debut in Splatoon 2 this weekend. A new flingza, yeahhh I’m so excited because the first one is the greatest weapon ever right...errrr no. The original has been virtually unseen in competitive play since the beginning of the game, but maybe this one will be different. The first things that come to mind when looking at a variant of a weapon are 1) if it is better than the other variant(s) of the main weapon and 2) how it matches up with other weapons with the same or similar kit. So let us begin comparing it to the original flingza roller which holds a splash wall as its sub and splat bomb launcher as the special. The splash wall and roller class don’t really share any synergy as most of the time using a roller you want to be either sharking or moving along the map stealthily with ninja squid. Therefore throwing a big splash wall as a target saying “here I am” often isn’t the best way to go. Additionally, you more than likely want to splat your target in one swing, as quickly as possible so they don’t reposition and take you down from afar. Throwing your splash wall pretty much gives them complete access to do so. So the vanilla flingza’s sub in splash wall isn’t optimal. The foil flingza on the other hand with its suction bomb seems to be a much more reliable option. One can throw the suction behind an enemy forcing them to push forward right into the swing of the roller. Also bombs in general are a great sub during the neutral game, meaning while teams aren’t necessarily in a firefight, but instead poking at each other getting a feel for the enemy. They are vital in getting back control after its been lost by possibly getting a pick to get back in or holding the control you do have not letting the enemy reach crucial areas. Therefore the foil flingza wins out in the sub weapon category. Now looking at the special’s for both variants, I have to say that as far as this meta is concerned I’m disappointed. Both the splat bomb launcher and the tentamissiles are underperforming in the current meta. It’s not that they are bad just that other specials such as the stingray, inkstorm, and splashdown dominate the game right now. Regardless let's analyze the two specials. Splat bomb launcher definitely has its uses, it is effective at retaking the splat zone or a quick pop on the rainmaker. Both of which being very objective focused puts the special in a fairly decent position. It also supports one of the roller classes’ weaknesses in painting the map, outside of the dynamo of the original Splatoon. This could give the roller the ink control it needs to move forward and secure a splat. Next the foil flingza’s tentamissiles which upon first sight, I immediately thought “why?” Going back to what I said about the roller class, the most beneficial play style is often sharking and being stealthy so why in the world would one want tentamissiles on this weapon. Using tentamissiles more often than not requires a safe position to be used without getting splatted. In other words, pack your flingza up, stop your duty in the front to midlines and give up the position to fire your tentamissiles and if lucky get a splat. I guess the tentamissiles could be used to locate the enemy position to pinpoint what area you want to guard, but honestly this is a bit of a stretch as its only reliable as the enemy are respawning. Even though the recent patch did buff the tentamissiles pretty well by allowing a faster time to launch when locking on to more targets, if you want to spam missiles just use a more reliable weapon that's probably already in the backlines like the mini splatling or also buffed in this patch jet squelcher. 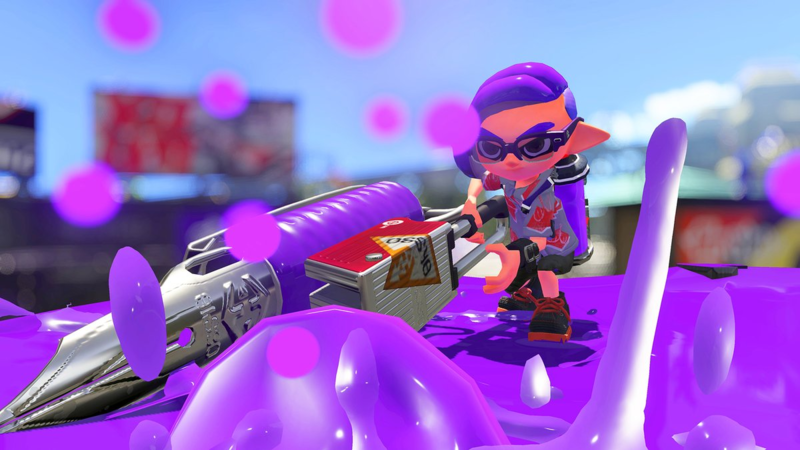 The lackluster coordination between the flingza roller itself and tentamissiles gives the edge strongly to the vanilla flingza variant with its splat bomb launcher. “Hey WALKY I don’t care what you say i think suction bombs and tentamissiles are a great kit to have.” Hmm suction bomb and tentamissiles, gee that sounds oddly familiar. Oh yeah it reminds me of a weapon that hasn’t been seen since the first week the game released no matter what the meta has been so far. The vanilla slosher. Suction bomb and tentamissiles haven’t work thus far for the slosher and more likely than not aren’t going to cut it in the current state of the game. The new feature of rollers the vertical flick, for most situations and roller types is actually just a worse slosher. The effective kill range of the vertical flick I find is unreliable and unless the target is literally right in front of you, you are better off just using a slosher. If you are fond of rollers and you think they fit your play style you are better off just using the regular splat roller. As far as rollers go it's the best of the bunch right now with the curling bomb and splashdown, which if I had to pick a sub and special for a roller at the current time it would be these two. Although, the Splatoon 2 developers wanted to make a hybrid roller with characteristics of the other types in regards to the flingza, so far it just feels like the worst of the rollers in one weapon. The kill range of both the horizontal and vertical flick seem off most of the time especially in comparison to the splat roller and even the dynamo in all honesty. After evaluating the kit and the weapon itself I’m pretty disappointed in the foil flingza roller. It doesn’t come close to the best roller and it's essentially a poor man’s slosher. Unless someone discovers some secret technique the flingza can pull off it is likely the weapon wont be making its way into the meta, as so many weapons do what the flingza can do just better. I’m pretty confident this weapon won’t be seeing much play for quite some time. As much as I would love more roller play in the current meta, I’m going to have to say that the foil flingza roller is going to CRASH and fall into the depths below Moray Towers for the time being. This is a great start to (What I’m sure) will be an awesome series! Keep it up!